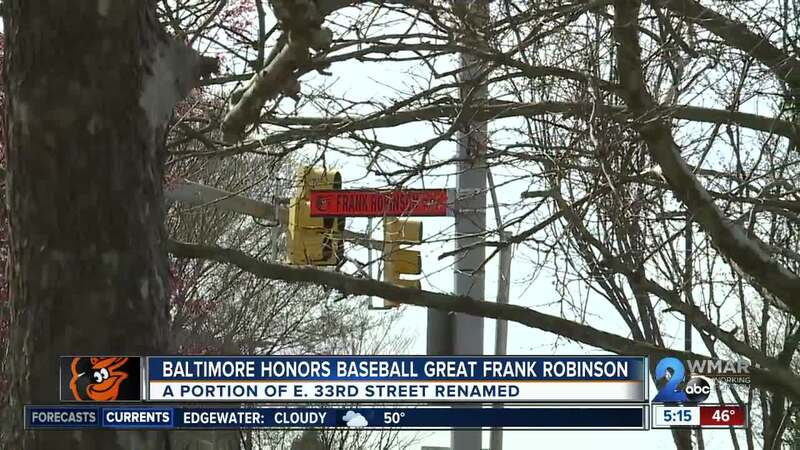 BALTIMORE, Md — A stretch of East 33rd Street will now be called Frank Robinson Way. Baltimore city officials held a ceremony Tuesday to honor the Orioles legend. It was the first event for Jack Young in his new role as ex officio mayor. "We stand where Memorial Stadium once stood, and where Frank Robinson made history," said Young. "The city wants to honor the memory of Frank Robinson, who made history as a baseball player, manager, and league executive here in Baltimore." The Orioles will also be honoring Robinson by wearing his No. 20 patch on their uniforms this season. They will also host a celebration of life Saturday before their home game against the New York Yankees. The Hall of Famer died in February at 83.